Homes For Our Troops would like to extend our deepest sympathies to the friends and family of Army SPC Robert J. Kislow III who died on July 30, 2013. He is survived by his fiancé and their two small children. SPC Kislow was two months into his first deployment in June 2005, when he was shot five times causing multiple injuries including TBI and an injury so severe that it required the amputation of his right leg. SPC Kislow enjoyed anything to do with the outdoors including hunting, fishing, and golf. He was a member of the VFW, Wounded Warriors, and Notre Dame Church. He had hoped to organize sporting trips for injured Veterans. 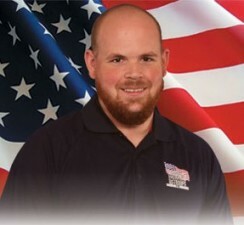 Through the efforts of hundreds of volunteers from the community as well as sponsors and donors throughout the country, SPC Kislow received the keys to his Pennsylvania home in December 2011.